Spotlight On… is a new regular blog which celebrates some of the chefs and restaurants we have published and their recent achievements. The Bell at Selsley, a beautiful village inn near Stroud, has recently been awarded two AA rosettes for the third time in row. 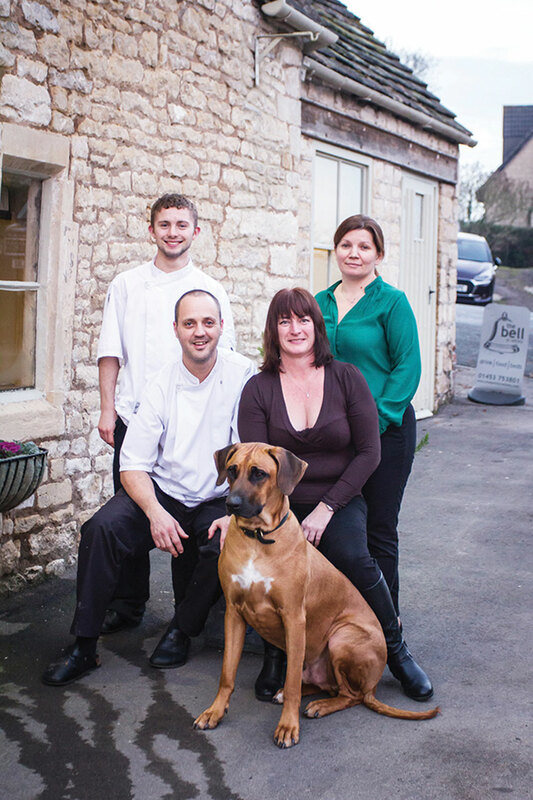 They featured in our Cotswolds Cook Book, released in 2017, showcasing their business. “Our ethos is to support local producers wherever possible and we strive to make everything ourselves on site,” owner Mark Payne explained to Meze. In July 2015 Mark and Sarah bought The Bell at Selsley, turning it into a Grade II-listed inn while preserving its 16th century English charm. Good food and drink is their passion and the heart of their business and everything is made from scratch. By processing regional and home grown produce the couple supports local businesses and enriches the quality of their menu. The Bell at Selsley offers pub classics such as burgers, pies, fish and chips, alongside creative meals. This combination makes the place a destination for quality dining and a stay in the Cotswolds countryside, while encouraging the community to gather for an evening beer. Intrigued? Then why not get a taste of what they have to offer by trying out some of the recipes they featured in The Cotswolds Cook Book. 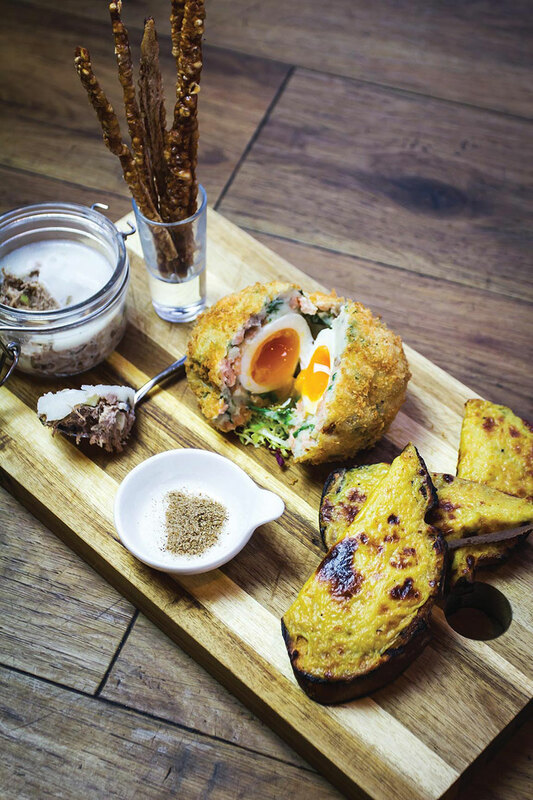 Here’s their Loch Duart salmon Scotch egg, smoked rarebit and pork and cider rillettes for you to have a look at. The Scotch eggs are delicious served hot with some toast to mop up the yolk. The rillettes, classic French comfort food with a West Country twist, make a generous 8 portions. The rarebit is delicious on its own or as a late night snack. Preheat the oven to 180°C. Prick the potatoes and sprinkle with salt. Place on a baking tray and bake for 50 minutes or until cooked. Allow to cool slightly. Cut open and scoop out the cooked flesh (this should yield 900g). Heat a little oil in a pan and sweat the onions down without colouring them. Remove from the heat and allow to cool. Fluff up the potato flesh with a fork until relatively smooth and then mix in the cooked onions, diced salmon and spinach. Season to taste. Take 170g of the mix and form into a ball. Make a well in the centre, pop the egg into the well and wrap the mixture around it evenly. Roll in seasoned flour, then egg and lastly panko breadcrumbs to give an even coating. Refrigerate for 2 hours. Preheat the oven to 180°C. Heat oil for deep-frying to 170°C. Deep-fry the Scotch eggs for 3 minutes then transfer to the oven for a further 3 minutes. Serve hot with a dish of celery salt on the side. Place the egg yolk, cheese, mustard, stout and Worcestershire sauce in a food processor and pulse until smooth. Add the cream and carefully pulse until just incorporated. Take care not to overwork and curdle the mixture. Lightly toast the sliced sourdough, spread a generous amount of the cheese mixture on top and grill until golden brown and glazed. Serve immediately. Any leftover mix will keep in the fridge for up to 3 days. Preheat the oven to 130°C. Remove the rind from the pork belly in one piece (ask your butcher to do this for you) and reserve it to make crackling, which is lovely served with the rillettes. Dice the pork into 5cm dice, place in a heavy casserole dish with the cider, garlic, bay leaves and salt and pepper. Add 1.5 litres water and bring to the boil. Cover with greaseproof paper and a tight-fitting lid and place in the oven for about 3 hours, until the meat is very soft. If there is any liquid left, bring the mixture back to the boil and reduce slowly until very nearly dry. Drain off and set aside half the fat and remove the bay leaves. Put the meat into a food mixer and mix with the paddle attachment slowly until it breaks up. Peel and finely dice the apples and mix into the pork. Check the seasoning and add a little of the reserved fat if the mixture is a little dry. Pack the mixture into serving glasses and allow to cool slightly before pouring a little of the remaining fat on top to form a ‘cap’. Chill in the refrigerator until cold and set. Serve with homemade pork crackling and some toast.